Load up on planks because the Devil's Roar is a dangerous place. Sea of Thieves’ Forsaken Shores DLC has received its official release date during the Gamescom 2018 Xbox Mixer stream. For those pirates looking forward to venturing into a new area, they won’t have to wait long because Forsaken Shores is due to launch September 19. 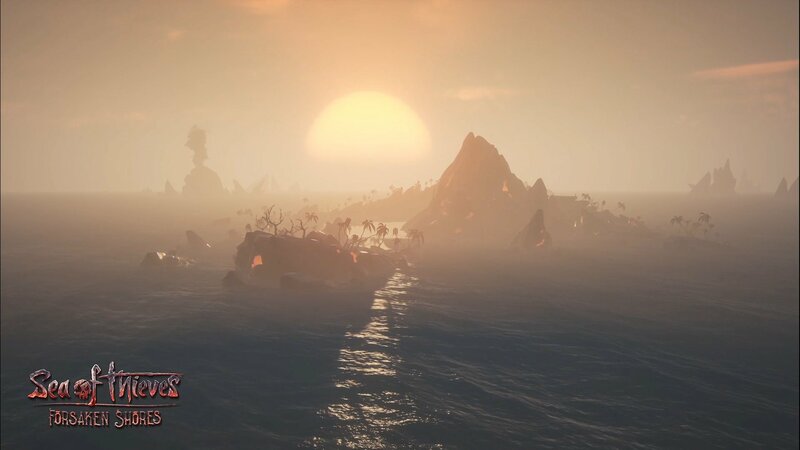 Joe Neate got to spit out a lot of information very quickly during his brief chat with Graeme Boyd about what players can expect from Forsaken Shores. The cargo runner quest type for the Merchant Alliance introduces three new items for players to deliver. Plants require water in order to survive, precious cloth must be kept dry from rain and bilge water, and crates of rum can’t be jostled or they’ll break. Keeping these items in good condition will yield a higher payment and any damages will reduce the value of the items. 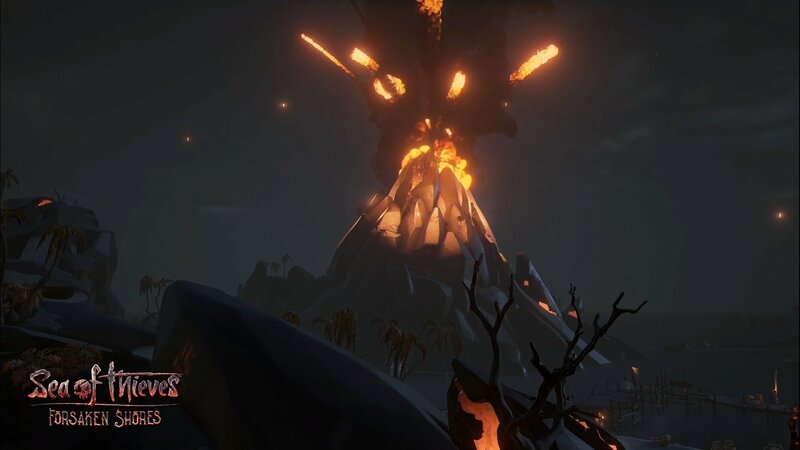 As players sail into the Devil’s Roar, they’ll discover that the new area is far more hostile than the other locations around the Sea of Thieves. Not only can the volcanos damage boats with the molten rocks they spew out during an eruption, the water can literally boil, cooking the players alive. To avoid taking damage from the water, players will want to locate row boats that appear in the world, and attach one to their ship for later use. While not a lot of information was given about the Devil’s Roar, there were several shots of the area shown during the interview, including a lovely snippet of an outpost. As I covered in my post-E3 Sea of Thieves write-up, fishing has been a hot topic for the community and Rare has been listening. Joe reaffirmed this fact during the stream, and although there’s no guarantee fishing will arrive with Forsaken Shores, that won’t stop me from hoping. 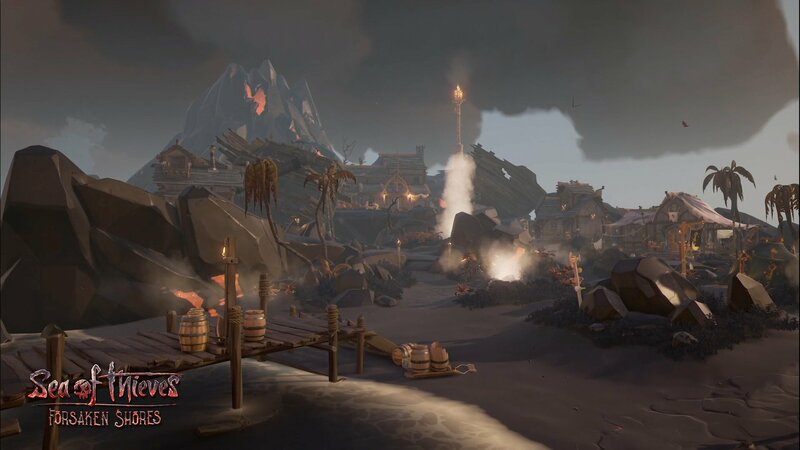 Forsaken Shores, Sea of Thieves third free content update, will be releasing September 19 for all players. Check out Shacknew’s video game release date schedule for a list of other upcoming titles. And of course, sail by our Sea of Thieves guide and walkthrough for other comprehensive articles.